Preheat the oven to 350° F and place a rack in the middle. Line a 9- by 13-inch baking pan with parchment paper, allowing some to drape over the sides of the pan. In a large bowl using a handheld electric mixer, or in the bowl of a stand mixer fitted with the paddle attachment, beat the butter and 2/3 cup of the sugar until light and creamy, about 3 minutes. Working on low speed, add the flour, baking powder, spices, and salt and mix well. Mix in the egg yolks and the milk until combined, then scrape the batter into the prepared pan. Clean and thoroughly dry the bowl of a stand mixer fitted with the whisk attachment. Pour in the egg whites, making sure there are no specks of yolk, and add the remaining 1 cup of sugar. Beat to soft peaks—be patient, it will happen. If the egg whites aren’t reaching soft peaks, wait until the mixture ribbons back onto itself. Spread this carefully on top of the cake layer. Cool the cake in the pan on a wire rack. Meanwhile, make the whipped cream: Pour the cream into a medium bowl and scrape in the vanilla seeds, discarding the pod. Beat to soft peaks with an electric mixer, about 3 minutes. Carefully transfer the cool cake to a cutting board. Cut the cake in half crosswise with a serrated knife. Place one half of the cake on your serving tray of choice and cover with the cream and banana slices. 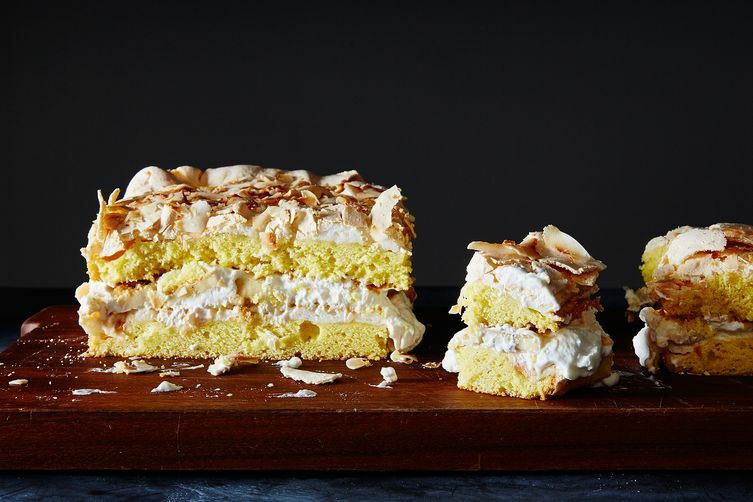 Place the other half, meringue side up, on top. Place the cake in the refrigerator to chill and soften for 1 hour before serving. ← Which Of These Bananas Is Better For You – Ripe Or Unripe?